Why is CIA officer George Branson dead? Out of the Agency and looking for work, former CIA analyst Lee Carruthers accepts the request of George's wife that Lee go to Dubai and find out what really happened. When she arrives, she walks into a deadly war between rival Merchants of Death for market share. She learns that George had worked for each man under a different name, one in Dubai and one in Istanbul. With his own, that gave George three identities. Which man was murdered? Had George really been working for the Agency, or had he sold out and, if so, to whom? Who are the men following her? And why does she keep finding diamonds? Is there life after the CIA? I wondered as I stamped my foot into the bindings of first one ski and then the other. I was among the few early birds on the slopes; we were hoping to avoid the rush of celebrities modeling their designer ski togs. The view was spectacular! Snowy hills covered with pine trees stretched away and away. I lowered my goggles and pushed off. As I gathered speed I laughed aloud at the awesome feel of the wind in my face, the best antidote to my time in the Algerian desert I could think of. Halfway down the piste, something buzzed past my face. Then I heard a crack. Somebody was shooting at me? I bent as far down as I could and snowplowed to the side of the run, stopping just before I got to the trees. Great! Nothing. Not even a knife. I ripped off my goggles and kicked out of the bindings. Stepping carefully into the woods, bent almost double, I advanced with a ski pole in each hand. I wish my gear wasn’t burgundy, I thought. On the other hand, I hadn’t expected to have to channel the Fourth Mountain Brigade that morning. I heard steps crunching toward me in the snow and ducked behind a tree. A man in black wearing a black face mask, his rifle held lightly in his right hand, slipped carefully forward, scanning to the left and to the right. He was looking too high to see me. When he was half a meter away, I yelled and launched myself at him with the ski poles thrust forward, but he deflected them with the rifle. He raised the rifle for another shot. I threw myself at him again, and he dropped the rifle. I grabbed it, and swung it hard, hitting him in the left shoulder. I reversed the rifle, backed up and fired. Off balance. Tried again. He turned and ran. Should I follow him? What would I do with him if I caught him? I considered the rifle. I could hardly take it back to the ski lodge with me. I dropped the clip and whacked it up against the side of a tree, sending a jolt all the way down to my toes, and buried it in the snow by the side of the trail, throwing the clip as far as I could into the woods. I retrieved my ski poles and stood panting, heart pounding. I started to tremble and told my body it would have to wait until I got to the bottom of the slope, but it paid no attention, so I trembled. “Who?” I asked myself. “Who?” I sat down with my back against a tree for a count of five hundred before I stopped shaking. Blowback from Morocco? I stomped the snow off my boots and slipped them into the ski bindings. I couldn’t find my goggles, but I wanted to be in cover as soon as possible so I didn’t spend much time looking for them. With a shooter in play, I felt terribly exposed. Maybe the shooter had a friend. Unarmed. I was unarmed. Not even a nail file. I wanted a gun and badly. Where could I get a gun in the peaceful countryside of Switzerland? Breaking into a gun shop was always an option. At the bottom of the slope, I kicked my way out of my skis and carried them back into the rack. I felt cold deep down inside, and gin seemed advisable. A drink in the lounge? Too public. Back in the room I made one of my very dry martinis—gin and a cube of ice. Maybe that would help me unscramble my brain. I looked at my watch. Ten thirty. Drinking in the morning was a sure sign of something or other. I finished the drink, but I was still cold. I took a long, hot shower and lay curled up under the duvet remembering. I had been sent to Morocco to find a missing colleague and wound up fighting my way out of a terrorist camp. They killed Kemal. I touched the bloodstained pearl hanging around my neck. I killed his killer, but Kemal was still dead. Would the Pure Warriors of Islam send an assassin all the way to Switzerland to get me? Possibly, but it seemed unlikely. Whoever he was, he knew me, and I didn’t know him. I went to sleep listing the people who might want to kill me. When I woke, I ordered lunch from room service. The waiter who delivered it looked like an Arab. Arab guest workers in Switzerland? The shooter could disappear into the crowd of Arab workers. He might even be one of them. If I couldn’t find and neutralize him, I was going to have to cut and run. I hate to do that, but I disapprove of assassination, particularly my own. MARILYNN LAREW is a historian who has published in such disparate fields as American colonial and architectural history, Vietnamese military history, and terrorism, and has taught courses in each of them in the University of Maryland System. 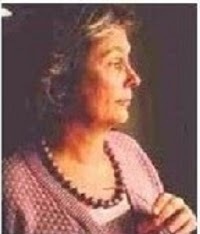 Before settling on the Mason-Dixon line in southern Pennsylvania, she lived in Nebraska, Iowa, Missouri, Georgia, Wisconsin, Ohio, South Carolina, Maryland, in Manila, and on Okinawa. It’s no surprise that she likes to travel. When she’s climbing the first hill in Istanbul to Topkapi Palace, strolling around Hoan Kiem Lake in Hanoi, or exploring the back streets of Kowloon, she is not just having fun, she’s looking for locations for her next novel. When she’s not traveling, she is writing or reading. She writes thrillers and likes to read them. She also likes to read Vietnamese history and Asian history in general, as well as military history. She lives with her husband in a 200-year-old farmhouse in southern Pennsylvania. She belongs to Sisters in Crime, the Guppies, and the Chinese Military History Society. This is a giveaway hosted by Partners In Crime Virtual Book Tours for Marilynn Larew. 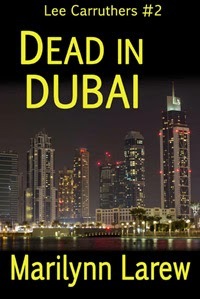 There will be TWO winners of an ebook copy of Dead in Dubai by Marilynn Larew. The giveaway is open to US residents only. The giveaway begins on April 27th, 2015 and runs through June 2nd, 2015. Visit the tour stops for additional giveaways! Thanks so much for introducing us to this series mystery and giving us a chance to win a copy! Many thanks for showcasing Dead in Dubai.